Red Marble Games' BreakQuest ( ) takes one of the oldest ideas in video gaming and adds a fresh new twist to create a really exciting experience. Brickbashing is one of the oldest and most tried and true gaming styles in the arcade genre -- many of us gamers in our 30s first cut our video gaming teeth on the Atari 2600 classic "Breakout," for example. The idea is that there are a row of bricks at the top of the screen, and you have to get rid of them by smacking them with a ball that you rebound using a paddle. It's a twitch-game in its purest form -- simple graphics, simple concept and utterly relentless non-stop action. It's you against the machine, and eventually you will lose. But it's fun to keep trying. Since the dawn of the original Breakout, this basic game has undergone countless revisions -- multiple paddles, colors, bricks that require different numbers of hits to disintegrate, powerups and so on. In the 1980s, we saw a huge evolutionary leap forward with the arcade hit "Arkanoid," which introduced powerups, bright color graphics and dizzying visual designs, but since then the basic gameplay of the brickbashing game has stayed the same -- enough so that it's become a cliché -- the sort of game that a junior shareware programmer might make to test his or her skills; enough so that I've even seen variants appear embedded in banner advertisements on Web sites. 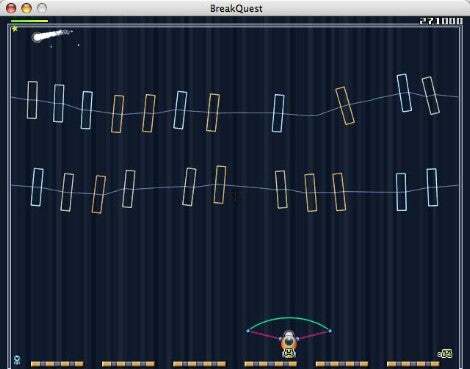 Developed originally for the PC by Nurium Games and converted to Mac OS X by Red Marble Games, BreakQuest takes the brickbashing concept in a new direction by applying physical rules and principals to game play across each of the 100 levels. Bricks can be different shapes and sizes, and levels can feature springs, dampers and bumpers that will change how the ball reacts. What's more, BreakQuest ties in the Arkanoid-inspired idea of powerups that imbue you with special abilities - multiballs, for example, or laser beams that you can use to disintegrate bricks that are on screen. Some are "powerdowns," for all intents and purposes -- yummies that might speed up the ball, for example, or shrink the width of your paddle. Either way, it's additional challenge. Game music and sound effects are well-suited to the retro-theme, providing an electronic and occasionally psychedelic backdrop to the swirling and compelling on-screen visuals. It's chock-full of warbly eight-bit goodness that sounds like the backdrop to your favorite Nintendo game of yore. Another bonus for gamers that fork over their US$20 for this game: An unlockable "arcade mode" that lets you set up the game with adjustments for ball speed, scene configuration, jumper sizing, power up customization, and more. It's not quite the same as a full-blown level editor but it comes awfully close. BreakQuest sure isn't for everyone: Brickbashing games are, at heart, pretty simplistic and repetitive games, and many gamers looking for more sophisticated fare are likely to find this game of only passing interest unless they're retro-gaming fans or yearning for an idea of what old-school games might have looked like back in the day, with more sophisticated hardware driving them. Make sure to look for the latest release from Red Marble Games' Web site (v1.0.3 as of this writing). The initial release - published in early July -- was plagued with some problems like poor cursor handling and bad full-screen support, but that was fixed in a later patch. I'm unclear on this game's specific system requirements -- Red Marble Games fails to specify that on their Web site. But as a shareware title, you have little to lose by downloading BreakQuest and giving it a try yourself to see how it measures up. The demo lets you play 8 levels (out of 100) to see if you like the idea before paying for it. The Bottom Line BreakQuest is a compelling redux of the classic brickbashing idea - the realistic physics provide some additional entertainment value in a genre that's been done to death otherwise.